The city of Haifa lies at the foot of mount Carmelo and is situated within the homonymous bay overlooking the Mediterranean. Thanks to its 268,300 inhabitants, it’s Israel’s third largest city and covers an overall area of 60 km². Haifa is also capital of the district bearing the same name. Characterise by its typically terraced countryside, the city offers a wide variety of wonderful views. The medieval fortress of Acri stands in the north-western region, close to the city’s important harbour, and looking towards east one can catch sight of mount Hermon. Haifa is a vivacious city and offers large beaches as well as green areas. It’s Israel’s major oil refinery centre and its industries include: steel and iron plants, shipyards, textile and electronic factories as well as food production sites. 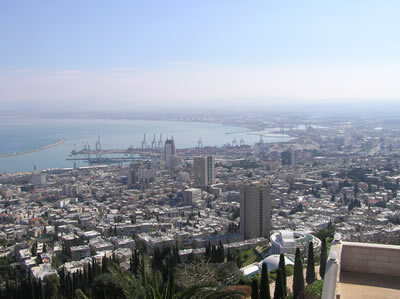 Haifa also hosts an industrial technological park where the major multinational computer companies have their headquarters. It’s an open city and has relations with cities throughout the world. Indeed, it sets an example of peaceful multi-ethnic (there are Jewish, Muslim, Arab Christian, Ahmadiyya, Druze and Baha'i communities) coexistence, though with a few difficulties. Haifa’s university was established in 1963, and since 1912 the city has been the seat of Technion, Israel’s Technology Institute. A road and rail network connect it to the rest of the country and Haifa hosts the Israel’s most important naval base and the state’s most important harbour. The City of Turin has undersigned cooperation agreements with the City of Haifa to promote and favour dialogue in an area where it has primary importance. Two formal acts precede the Agreement Memorandum between Turin Council and the Israeli Municipality signed in September 2005: City Council Motion no. 50 approved on October 22nd 1996, stemming from the intention of supporting and encouraging the Middle East peace process by increasing existing relationships further and establishing new ones, and Municipal Council Deliberation number 01362/01 dated March 6th 1997, which approved twinning Turin City with the Cities of Gaza and Haifa. The institutional partnership between Turin and Haifa is coherent with the traditional presence of Turin’s non profit bodies in the Israeli-Palestinian area and with the intention of coordinating Turin City’s policies with Co.Co.Pa., ANCI, the National Coordination of Local Authorities for peace and human rights and other European Cities. Torna alla pagina "Iniziative per città"